Field Dalling Holt Road post mill had a roundhouse and ran two pairs of French burr stones. A horse mill was also used on the site. A new erected POST WINDMILL with two pair of French stones & all going geers complete, upon a small scale; also a Horse Mill & Granary with two acres of Land belonging thereto. Enquire of Mr. Thos. Youngman, Letheringsett or to Mr. Thos. 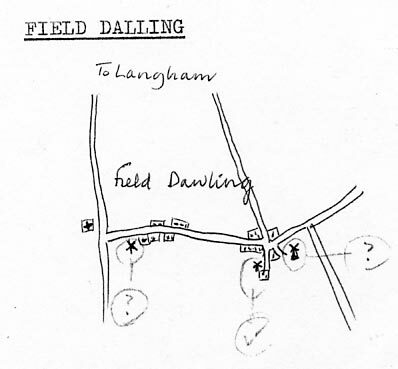 Jex, Field Dalling, who will shew the premises. A Substantial POST WINDMILL with good Roundhouse situated at Field Dalling in the county of Norfolk. Apply personally or by letter post paid to Mr. Thomas Daplyn Jun. Hindringham or to Mr. Youngman, Letheringsett.